I had planned on making homemade powdered donuts for our anniversary breakfast but decided on a German pancake. Heat your oven to 400F and melt butter in a cast iron skillet. 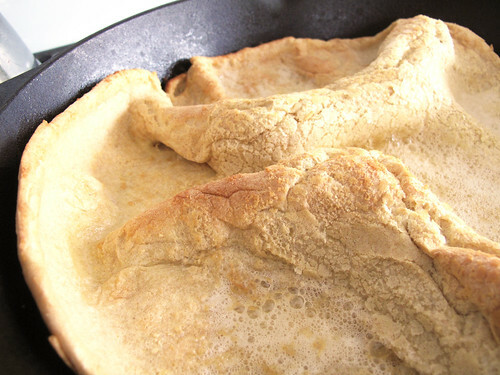 Mix your eggs, milk, flour and salt together until smooth (no lumps like normal pancake batter). Pour batter into cast iron skillet on top of the butter. Bake for 15 minutes or until golden brown on top. Top with lemon and powdered sugar. We also used a little bit of honey. You can also use jam or maple syrup as well. Whatever suits your fancy.